Captain Lorenzo Giacomuzzi is reluctant to hoist the sails. We’re on passage from Villefranche to Monaco in the first of a new line of Swan 95s, and the winds are light. “We can get the sails out, but we’re not going to go anywhere,” he tells me. I know the skipper is anxious to get to Port Hercules by midday, but I haven’t flown all the way down from Hamburg simply to motor around in Lot 99, one of the world’s sleekest, newest production superyachts from Finnish maestro Nautor’s Swan. Five minutes later, we’re outpacing the true wind on a beat. 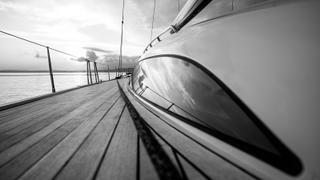 The engine is off at last and the boat touches five knots of hull speed — not bad in four knots of limpid breeze. “She needs eight to 10 knots to get going properly,” Giacomuzzi persists. More impressive, to my eyes, is the speed with which the captain converted the boat from motor to sail mode. The innovative lifting keel took a minute or so to ease down on its hydraulics, using a remote control in the saloon. Then the mainsail went up on a single push button, and the jib unfurled silently. 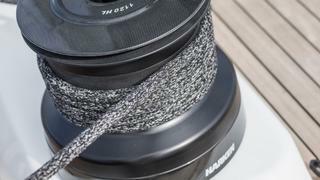 It was a simple task for the skipper and his first mate — one that belied the hours of calibration and sea trials needed to match the furler speed to the halyard rate. And herein lies the key to this beautiful €10 million expanse of carbon fibre wizardry and careful interior design: she is incredibly simple to handle. 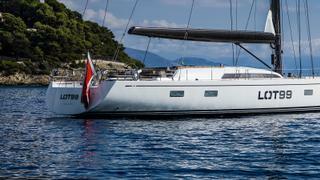 The owner, who upsized from a Swan 66, is a Dutchman who loves cruising, but can’t bear to go slowly. So he hasn’t held back when it comes to features that improve performance (starting with the high-tech carbon fibre-foam sandwich hull and lifting keel), but he has balanced every performance decision against the need to remain offshore for weeks, far away from the shipyards and repair facilities of Europe. For this reason, he picked the raised saloon (S) version of the 95 off the drawing board. Naval architect Germán Frers also designed a “flush deck” (FD) version of the 95 intended for the race circuit, which carries around a tonne less weight (thanks to the smaller coachroof). 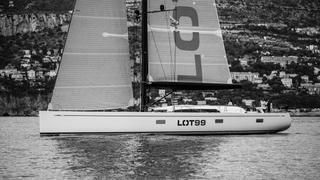 Frers has designed every cruising yacht for Swan since 1981, and his signature is everywhere: the near straight sheerline, plumb bow and reverse transom, and the long, elegant cockpit open at the transom. 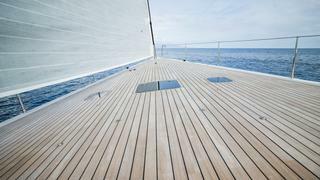 The deck design, he says, favours “simpler, cleaner, uncluttered arrangements and sun protection options”. In line with the 3Di sails, the high-aspect mast and boom by Hall Spars are carbon fibre, as well as the winch drums and the pedestals. You wouldn’t know it, under the expanse of teak decking that runs from the companionway to the transom, but there is a drop-down bathing platform that reveals a garage that can accommodate a 4.2 metre tender. Lighting is the other area where the owner’s vision is most evident. “The client wanted to have simpler to understand switches — easy on and off. But he also wanted a lot of lights — indirect, spots, under the bed and so on — all with different scenarios for each area: say, watching television mode or evening dining,” says Kjellman. This element emerged later in the design process, forcing the Swan team to redesign some of the electrical systems, using a large-buttoned, four-mood system from Lighting Design International. The digital switching technology behind the lighting is also used throughout the boat to turn other systems on and off. If the technology is impressive, so is Lot 99’s social heart — the saloon, with its raised coachroof and wraparound windows. This space could really have suffered from the addition of a large box housing the hydraulics and the keel in its raised position, but the design team came up with a stylish solution. 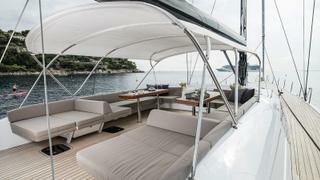 The box is elegantly curved at the edges, and clad in water buffalo leather, giving it an architectural quality as its acts to separate the dining area to port and the sofa space to starboard. There’s a natural, understated Italian feel to the interior design. 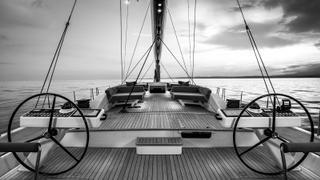 “The brief was to create a yacht interior with the comfort of a home, yet seaworthy,” De Carlo says. Upholstery in light herringbone fabric from Loro Piana, with joinery in European oak lightly stained with a colour called tundra titanium, was chosen to complement the leather. The colour scheme runs throughout the boat, from the full-width owner’s suite aft, through the three guest cabins (two twins and bunks for the children) to the galley and crew quarters forward. Back in Monaco, Captain Giacomuzzi skilfully backs the boat into a berth that barely offers enough beam for a fender. Lot 99 is soon made fast, but it feels like this all-purpose yacht is yearning to get away. She has the classic Swan lines that promise speed and faithful handling, but this conceals a slightly beamier, more comfortable interior for cruising. Go-anywhere sailing boats have never looked as good. First published in the February 2018 edition of Boat International.